I don't know about you but I seriously cannot believe it's already November! I have to admit, November came in with a bang since I woke up this weekend to 37 degree temperatures. When it was in the 80's on Friday! I have to admit, the cold front was definitely welcomed since I was able to break out the hot chocolate and try a new soup recipe without just pretending it was cool out. Despite it being Halloween on Friday I didn't do much this weekend but I'm linking up with my girl Biana for our weekend recap any way! I'm sure she's super happy about her Gators win this weekend... I wish I could say the same about my team! Friday was Halloween obviously. Usually I love to get dressed up and go out and people watch but I just wasn't feeling it this year. October was a pretty rough month for me so while one part of my wanted to send it off with a bang the other part of me just wanted to relax and wish it adieu. Plus downtown Orlando on Halloween (and New Years Eve) is pretty much amateur night. So instead I sat at home with this ridiculous cuteness (my bunny ears didn't last long on him) and watched scary movies and ate all the Twix I could find! Saturday UCF played bright and early (really getting sick of these noon kick offs!) so I made a huge sausage, egg and cheese biscuit spread with southern style potatoes. Unlike Biana and Amanda's team, my team sadly lost. It was a horrible game and our first conference loss since we joined the AAC. Thank goodness we have a bye this week, we need it! 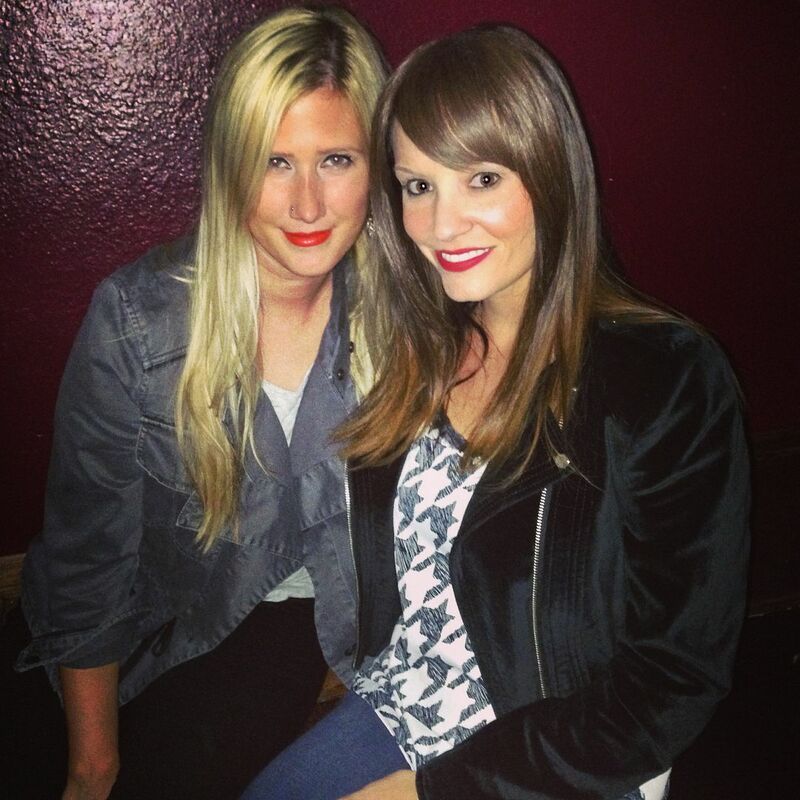 Saturday night I went out with this pretty lady and tricked everyone into thinking I had got bangs! Including Kerri who almost didn't recognize me at first! I figured since I didn't really get to dress up for Halloween I was going to do my best brunette Taylor Swift impression out Saturday night ;) The hubby was at home sick (and I was trying to avoid getting sick since I have a busy week coming up) so we decided to do some bar/restaurant hopping around her neighborhood. 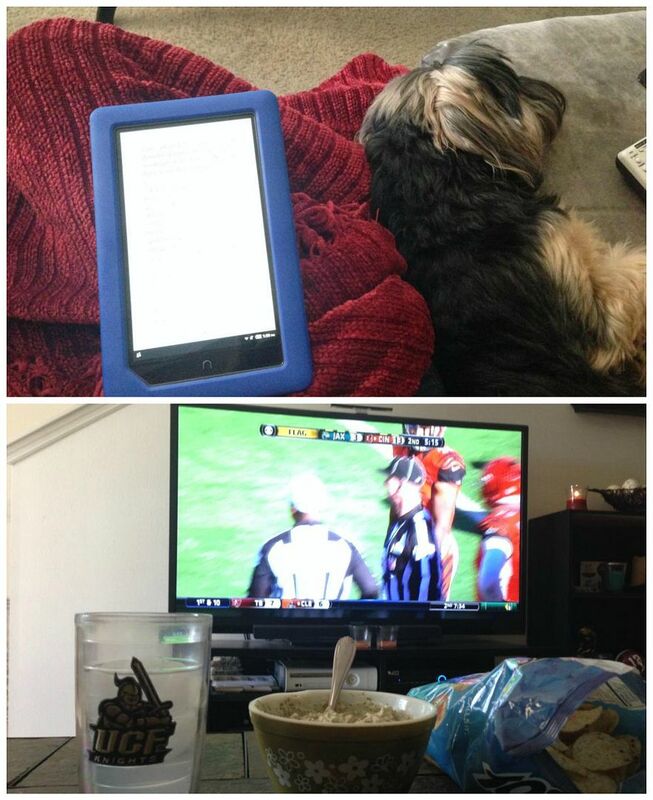 Sunday was spent cuddling on the couch with my little furbaby and reading while watching my two favorite NFL teams play each other. While I'll always be a Bengals fan, the Jags have become my "Florida team" so it's kinda fun to watch them play each other. It was pretty awesome getting to go to the Bengals/Jags game in Jacksonville 2012 and I can't wait for the Bengals/Bucs game coming up! Hope everyone had an amazing weekend and a fun Halloween! It's time for me to go run off all that candy I ate this weekend! Sounds like a perfect weekend, minus the football loss. We had a bad one against Florida too. I really love the bangs on you, you look fabulous! I completely agree about it already being November, October flew by! Before we know it it will be 2015 already- yikes! Glad to hear you had a good weekend other than the football loss! Oh wow, I was totally fooled by the bangs! If you decide to go with them for real, they look really cute! Looks like a cozy weekend! And I'm digging the bangs on you! You should consider it! Well, you for sure fooled me with the bangs! I definitely think you should cut your hair like that, though - it's a fabulous look on you! 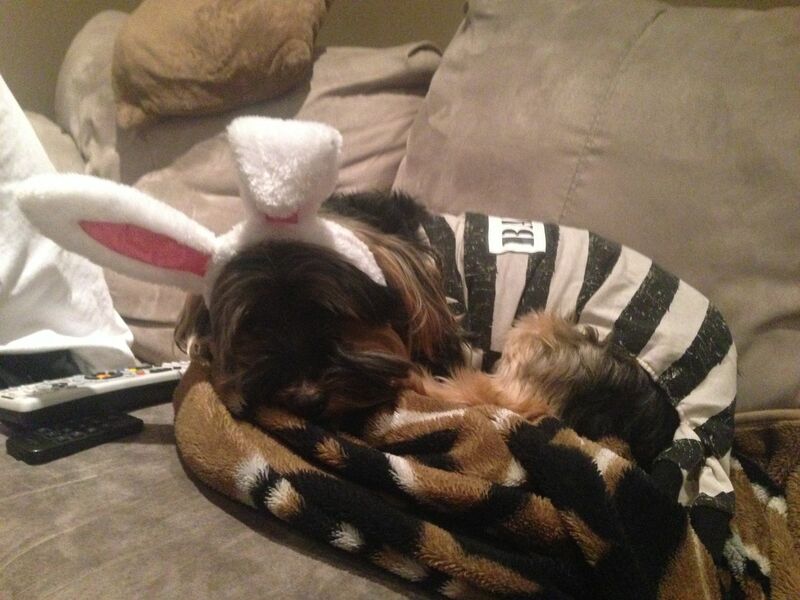 Your pup is too cute with the bunny ears. Happy Monday! love the bangs, are they clip on?? I live for lazy weekends, cuddled up with my boys, especially with this crazy cold front the flew in, I might never leave my house! Sounds like the perfect cozy weekend, I cannot believe how cold it is here but am so thankful it'll be back in the low 80's this week. This CT girl cannot take the cold anymore brrrrrrrrr! A girl after my own heart...I sadly owned a few too many Twix this weekend, but they are just so delicious! Sounds like you had a pretty relaxing weekend, which I agree is one you need before a busy week - have a great one! Oh my god, the bunny ears are too much! I didn't dress my Millie up this year -- missed opportunity. Sorry you didn't get out too much, but with the weather that came in, it was probably smart. Well now you that you can TOTALLY rock bangs!! That hairstyle seriously looks SO good on you!! Your weekend sounds so good, especially the twix part! I was hoping to binge on Mia's candy but she only picked ONE twix. The girl kept going for the suckers... what the heck?? Ha ha! I've been meaning to email you, I hope things are looking up! I hope November is going to be the best month for you, you deserve it!! sounds like a nice weekend!!! hope the hubs is better soon! Being a fellow florida girl, I am hoping this weather stays! It is gorgeous and my pups are loving it! Sometimes a quiet weekend with lots of furbaby snuggling is all someone needs! 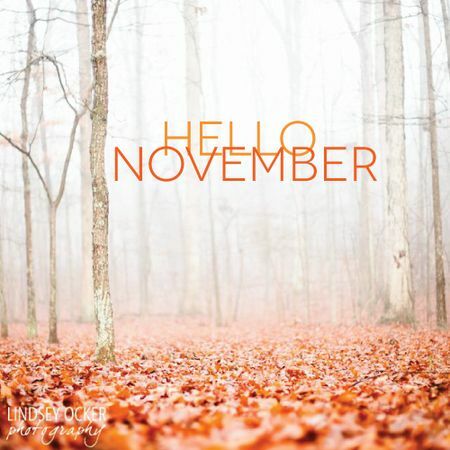 Hoping that November is a better month for you. I too cannot believe it's already November. Where does time go? I'm so excited for the Holidays. Sounds like it was a great weekend. Happy Monday!! Oh let me tell you, my moms best friend came to NC this weekend from Florida and she was absolutely hating the weather here..we were also in the cold and rain and she was telling me how nice the weather had been in Florida and she was not prepared for the cold this weekend! That costume!! What a cutie! I am all about dressing up the pups! I also LOVE the bangs even if they're faux! That's a great look on you!! What a pretty November pic! Love the pup pic too. Glad you had a good weekend. Your fur baby is so cute. I spent last night under a blanket cuddling with fuzzy cats, it's very nice X). My team lost this week, too. It has been a rough football season for the Gamecocks. How cute is Nov in his costume?! Still think you should go for the bangs! Love them on you! Sounds like a pretty great weekend minus the loss. Look at you sporting those sassy bangs! Oh my goodness, how adorable! My pup won't keep anything that's not a bow on her head. I seriously thought those were real bangs! Regardless they look great on you! I was totally fooled by the bangs! I gotta try that. Last day on my giveaway. Your weekend in sounds fabulous. Love the bangs, super cute. I did have bangs once and they were super fun, but with my curly locks I'd have to straighten everyday. Yea I was about to ask if you got a new "do"! How do you pretend to have bangs? I have the same UCF Tervis tubmlers. They're the best cups! Sounds like a fun, but relaxing weekend! I got to go to the Michigan game on Saturday and we actually won, so that ended up being a great time! Loooove you with bangs!! Are they just clip-ins? Hope you have a great week, Pamela! Love your hair! Looks so good! We didn't do much for Halloween this year either, but I have to say, I have no complaints with that. Sounds like you had a great weekend! So how did you get those bangs?? You totally had me fooled!! And my Halloween was pretty relaxed too, just watched American Horror Story. But I'm wit you on the cold front, this morning my iPhone said 29 degrees... What?!? Sounds like a really fun weekend. I enjoyed my fair share of Twix too, or should I say, stole all the Twix and Reese Cups out of my sons trick or treat bucket! You could totally rock bangs, super cute on you! Sounds like a great weekend to me. I like to stay in with my little family and relax! sounds like a fun weekend! your puppy is so cute in bunny ears and we totally thought you got bangs for real! you totally had me fooled with the hair, sneaky! were they clip ins or something? i had a super relaxing halloween, handed out candy and watched bad movies. it was awesome. here's to novemeber being better than october! Bangs look great on you!! Our Halloween was super low key as well, and even though I was a little bummed looking at pics of all the amazing costumes/party-goers the next morning I'm happy we didn't do anything. I'm honestly not crazy about Halloween - I like it but don't love it... love scary movies though. :) Happy Monday!! How is it November already!? These days need to slow down already! My Halloween night looked a lot like yours.... and I loved every minute of it! Looking at your rocking those bangs! Love them! Something about fall makes me always want to change up my hair (hence, bangs last year ha). Love that puppy pic! Those are the best kind of Sundays! Sounds like a good weekend! You totally had me fooled with the bangs! You would look fabulous with them if you ever do get them! Happy Monday, girly! It was brutal seeing GA loose to Florida... so I'm with you on the pain of last weekend's game. I'm so glad the cold front is here so I can get cozy inside! Staying local is always a fun thing to do. I was so psyched (and surprised) the Gators won. It's been a tough season for sure. Hope you stay healthy! You totally fooled me--def. thought you got bangs--which are adorable on you BTW! Can't believe it was that chilly there--but I bet you all loved it :) We have hated it here but that because we have about 6 more months of it ha! you DEFINITELY fooled me. i love the bangs on you!!!! You look ADORABLE with the bangs!! Is it an extension piece? I just got a "side swept bang" one from Bellami extensions but have yet to try it. Yours looks so natural! I'm confused please tell me more about these faux bangs...you both look gorg in that picture! I definitely thought you got bangs! They look amazing even if they aren't real! haha Love your red lip too! I totally fell for the bang thing too! Lol! They look great on you though! I can't believe it was from 80 to 37 that fast!